For the rugby league footballer of the 1920s, and 1930s, see Norman Shaw (rugby league). Richard Norman Shaw RA (7 May 1831 – 17 November 1912), sometimes known as Norman Shaw, was a Scottish architect who worked from the 1870s to the 1900s, known for his country houses and for commercial buildings. He is considered to be among the greatest of British architects; his influence on architectural style was strongest in the 1880s and 1890s. Shaw was born in Edinburgh, and trained in the London office of William Burn with George Edmund Street. Shaw attended the Royal Academy classes and received a grounding in classicism. There, he met William Eden Nesfield, with whom he briefly partnered in some architectural designs. In 1854–1856 Shaw travelled with a Royal Academy scholarship, collecting sketches that were published as Architectural Sketches from the Continent, 1858. In 1863, after sixteen years of training, Shaw opened a practice for a short time with Nesfield. In 1872, he was elected an Associate of the Royal Academy. Shaw worked, among others, for the artists John Callcott Horsley and George Henry Boughton, and the industrialist Lord Armstrong. 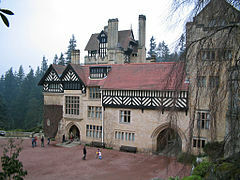 He designed large houses such as Cragside, Grim's Dyke, and Chigwell Hall, as well as a series of commercial buildings using a wide range of styles. Shaw's early country houses avoided Neo-Gothic and the academic styles, reviving vernacular materials like half timber and hanging tiles, with projecting gables and tall massive chimneys with "inglenooks" for warm seating. Shaw's houses soon attracted the misnomer the "Queen Anne style". As his skills developed, he dropped some of the mannered detailing, his buildings gained in dignity, and acquired an air of serenity and a quiet homely charm which were less conspicuous in his earlier works; half timber construction was more sparingly used, and finally disappeared entirely. All Saints’ Church, Youlgreave Youlgreave Derbyshire 1869 - 1870 Restoration. St Giles' Church Longstone Derbyshire 1872-73 Restoration. Baldslow Place St Leonards-on-Sea East Sussex 1888 Originally the Ebden family home, now Claremont School. Chigwell Hall Chigwell Essex 1876 The building is now owned by the Metropolitan Police. St John's Church Boxmoor Hertfordshire 1874 Grade II listed church. Alcroft Grange Tyler Hill, Canterbury Kent 1880s Now divided into 4 wings. Bailiff's Cottage Bromley Palace Estate, Bromley Kent 1864 Demolished. Town Hall Market Square, Bromley Kent 1863 Unexecuted. New Zealand Chambers Leadenhall Street London 1871–73 Destroyed by enemy action, WWII. 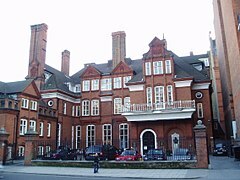 Lowther Lodge Kensington London 1873–75 Headquarters of the Royal Geographical Society. 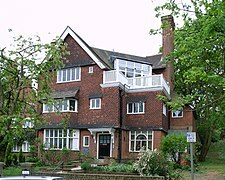 6 Ellerdale Road Hampstead London Built for himself. 8 Melbury Road Kensington London 1872–73 Built for painter Marcus Stone. Woodland House 31 Melbury Road, Kensington London 1876–77 Built for painter Luke Fildes. 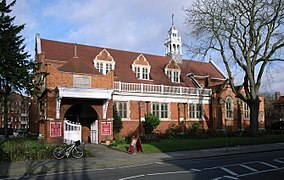 Bedford Park London 1879–82 The first "garden city" suburban development: housing, including St. Michael and All Angels Church. Bolney House Kingston House estate, London Knightsbridge London 1883 Demolished in the 1960s. Norman Shaw Buildings Thames Embankment London 1887–1906 Originally built as the new headquarters of the Metropolitan Police, and the first location to be known as New Scotland Yard. The two buildings are now used as Parliamentary offices. 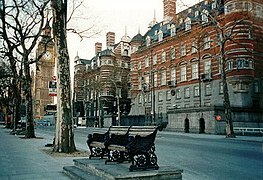 Piccadilly Hotel Piccadilly Circus London 1905–08 His last work. Knight's Bank Farnham Surrey 1868 Demolished 1932. Alderbrook Park Cranleigh Surrey 1881 Demolished 1956 - house for Pandeli Ralli. Bannow St. Leonard's Sussex 1877–79 Private house, now nursing home. Old School House Hammerwood, Nr East Grinstead West Sussex 1872 Formerly the village school. Holy Trinity Church Bingley Yorkshire 1866–68 Demolished 1974. ^ a b "Richard Norman Shaw". www.victorianweb.org. 18 November 2015. Retrieved 7 December 2018. ^ "Shaw, Richard Norman". Who's Who. Vol. 59. 1907. p. 1591. ^ Richard Norman Shaw, editor: Architecture: A profession or an art: thirteen short essays on the qualifications and training of architects, London, Murray, 1892. Contributors include: R. Norman Shaw, J. T. Micklethwaite, Reginald Blomfield, G.F. Bodley, Mervyn Macartney, Ernest Newton, Edward S. Prior, John R. Clayton, Basil Champneys, W.R. Lethaby, W.B. Richmond, Gerald Horsley and T.G. Jackson. ^ Hill, Rosemary (29 March 2008). "Rosemary Hill on the architect Richard Norman Shaw". The Guardian. ISSN 0261-3077. Retrieved 7 December 2018. ^ "Richard Norman Shaw". Blue Plaques Guide. Retrieved 9 December 2018. ^ "Richard Norman Shaw's house, 6 Ellerdale Road, Hampstead, London | RIBA". RIBApix. Retrieved 9 December 2018. ^ "Norman Shaw". Find a Grave. Retrieved 9 December 2018. ^ John Martin. "Y900003 / Youth Hostels Association (England and Wales) / Historical listing of all youth hostels and associated accommodation" (PDF). Retrieved 22 November 2016. ^ "Check out this property for sale on Rightmove!". Rightmove.co.uk. Retrieved 5 June 2017. ^ a b John Bold; Tanis Hinchcliffe; Scott Forrester (27 January 2009). Discovering London's Buildings: With Twelve Walks. frances lincoln ltd. pp. 105–. ISBN 978-0-7112-2918-1. Retrieved 1 July 2012. ^ Historic England. 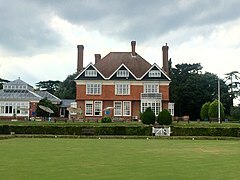 "GRIMSDYKE, Harrow (1079676)". National Heritage List for England. Retrieved 5 June 2017. ^ a b "Survey of London: volume 37: Northern Kensington". British History Online. Retrieved 28 June 2012. This article incorporates text from a publication now in the public domain: Chisholm, Hugh, ed. (1911). "Shaw, Richard Norman" . Encyclopædia Britannica (11th ed.). Cambridge University Press. Andrew Saint, Richard Norman Shaw, revised edition, 2010.ISBN 978-0-300-15526-6. 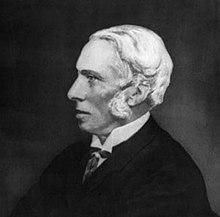 Wikimedia Commons has media related to Richard Norman Shaw.